Les Malgre-Nous: A digital history of the French men and women in the German Werhmacht and Waffen-SS. The history books are full of examples describing the scores of crimes committed by invading armies, from massacres, lootings, destructions, to enrolling by force the local populations for labor and even as troops for replenishing their ranks. There are often however limited details on the nature and consequences of those crimes. The records are usually scarce, the victors are not prone to expand on such topics, and the humiliation, shame, and desire of revenge felt by the conquered are often an hindrance to providing an unbiased account of such events. There are exceptions to such rules of silence, one of which is the topic covered in these pages. The stories of the "Malgré Nous" (French: "Against our will"), the young Alsatians and Mosellans from the East part of France that were incorporated by force in the German Army during the second World War between 1942 and 1945, is still vivid in the memories of the people that live in those regions. There remain survivors, some of which have published memoirs of their experiences. Many records related to those Malgré Nous have been released from archives of the Second World War.1 A clear and unbiased history of the Malgré Nous however is still not yet available, maybe because their history is so recent. From traitors for some to resistants for others, from victims to collaborators, all opinions have been expressed.2 The official treatment of the Malgré Nous in France after the second World War does not help: from the difficulties to bring back home those that were kept in Russian and American prisoner camps, to the inconsistensies of the judgments in the post-war trials that involved French soldiers enrolled in the German armies, there are many difficulties in building an unbiased account of their stories. These pages are an humble attempt to correct this. The modern history of Alsace and Lorraine has largely been shaped by the conflicts between France and Germany. France has always considered that the Rhine river forms a "natural border" on its North-East side. As such, it alwatys thought of annexing the regions West of the Rhine river: Alsace was progressively conquered by Louis XIV is the 17th century, while Lorraine was added to France in the 18th century by Louis XV. The presence however of a large German-speaking population in those regions and German nationalism during the 19th century lead to the newly created German empire asking for Alsace and the Northern part of Lorraine to be attached to the empire, following their victory in the Franco-Prussian war of 1870. The peace treaty of Frankfurt of May 10th 1871 3 granted this request, with close to 1700 villages nd cities from France switching to German control. Those cities were mostly in Alsace, in the départments of Bas-Rhin and Haut-Rhin, with the exception of Belfort and its surrounding (which formed consequently a new départment after that), and in the Northern part of Lorraine, including the départment of Moselle, and part of the départments of Meurthe and Vosges. While the majority of the population living in those regions spoke some German dialect 4, the interests of Germany in those territories were multiple. Strategically, Germany thought of those regions as a buffer and important area of control, should there ever be a future war with France. In addition, Alsace-Lorraine had plenty of natural resources: as a consequence of the treaty, France lost 20% of its mining and steel industry. The treaty of Frankfurt polarized France towards Germany, leading to a desire to reconquer Alsace-Lorraine the so-called "revanchard" spirit.5 This reconquest, or restitution, was even addressed by US president Wilson in 1918 in his Fourteen Points speech. Alsace-Lorraine returned to France after the first World War lost by Germany under the 1919 Treaty of Versailles. It is noteworthy that this restitution recognized the specific rights of the local populations, and maintained a local regime within this region, the so called "local law" that are still in place today. Black is modern border; border of German Empire between 1871 and 1918 in yellow. 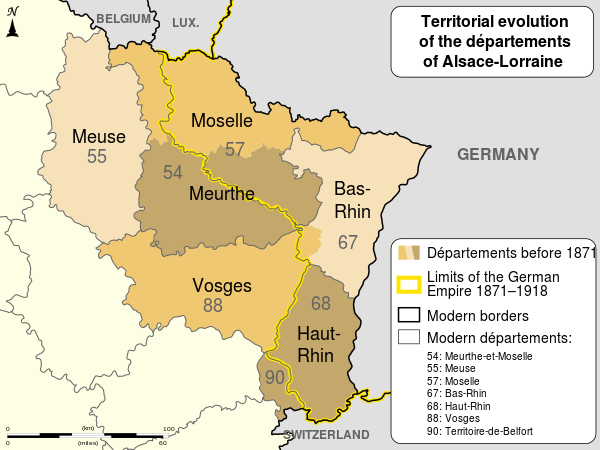 The 1871 Treaty of Frankfurt recognized the Alsace and Moselle were officially annexed to Germany. As a consequence, during the First World War between 1914 and 1918, more than 380,000 men from those regions were legally drafted in the German army, even if deep in their heart they felt it was against their will as they considered themselves as French. In order to spare them possible confrontations with relatives in France however, German Army draftees from Alsace-Lorraine were sent mainly to the Eastern front, or the Navy. The situation is very different during the Second World War, both socially, and legally. The 100,000 young Alsatians and 30,000 young Mosellans that were drafted in the German army were French by heart, being born in France. Some in fact had even fought in the French army in 1940. Legally, the decrees signed on August 19 and August 25 1942 to force young Mosellans and Alsatians to be drafted in the German army were in direct violation of the Armistice signed in 1940, and of the International Convention of La Haye. Who are the Malgré Nous? The term "Malgré Nous" (from French, meaning "Against our Will", in German "Wider unseren Willen") first appeared in the 1920s, as associations of Alsatian and Mosellan Veterans of the First World War used it to highlight that they had to fight against their will as part of the German Army.9 It is better known however when it is used to characterized the Alsatians and Mosellans that were "incorporés de force" (French: 'drafted by force") in the German armies (Wehrmacht and Waffen-SS) during the Second World War between 1942 and 1945. It should be noted that even though this term is not used to designate them, the position of many Belgians and Luxemburgians who lived in regions that were annexed to Germany and that were also drafted by force in the Wehrmacht follows the same problematic. 10 In addition, it is usually understood as relevant for men. More than 10000 women experienced similar fate, being drafted into the general German War effort 11; those women are referred to as "Malgré Elles" in French, though they prefer the term of "Incorporées de Force." Following the annexation of Alsace-Lorraine in 1940, the German administration led by Gauleiter Wagner in Alsace and Gauleiter Bürckel in Moselle enforced a germanization and a nazification of the two regions. 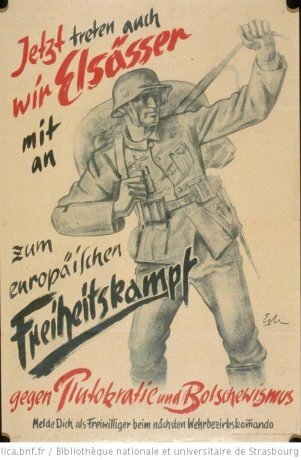 The numorous propaganda campaigns to attract the young people living in those regions to participate in the German war efforts met however with little success. In spring 1942, Gauleiters Wagner and Bürckel convinced Hitler that forced drafting was in order. Hitler conceded to their requests, despite initial opposition from the Wehrmacht that did not trust Alsatians. Consequently, on August 19 in Moselle and August 25 in Alsace, Bürckel and Wagner signed decrees enforcing drafts of young Mosellans and Alsatians. It is noteworthy that decrees officializing the fact that those Alsatians and Mosellans were German citizens were signed in parallel. During the period 1943 to 1945, 100,000 Alsatians and 30,000 Mosellans were then forced to join the Wehrmacht or the Waffen-SS. Those who resisted the orders risked being arrested, or seeing their families being arrested and sent to Eastern regions of the German Reich, or even in concentration camps. Still, it is estimated that close to 40,000 escaped draft or deserted. It is usually conceded that most of those that were drafted fought on the Eastern front, though we will see that they were involved on the multiple European fronts of the war. Many of the Malgré Nous were taken prisoners by the Soviet Army, either on the battlefield or after they had deserted. 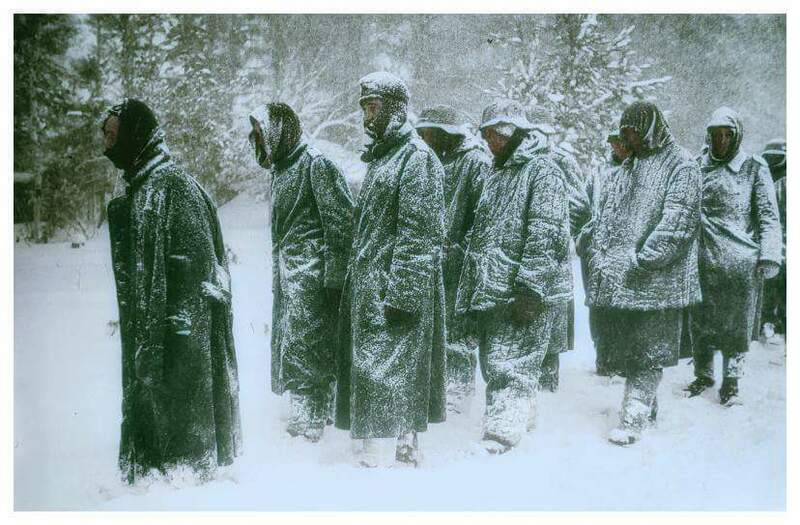 As the Soviets were not aware of the specific situations of those French soldiers, they treated them as any German prisoners, meaning that they were sent to camps. Most of the Malgré Nous were sent to Tambov, where many perished as a consequence of the harsh conditions there. The 130,000 Malgré Nous from Alsace-Lorraine represented close to 1% of the total German forces during the Second Wolrd War. Among those 130,000, it is usually assumed that some 30,000 were killed in action and 10,000 are still missing. Between 5,000 and 10,000 of those that were prisoners of war died in captivity, most of them at Tambov. 40,000 of the Malgré Nous were invalids after the war. The trial of Bordeaux14 in 1953 best illustrates the difficulties encountered by the Malgré Nous after the Second World War. On June 10 1944, the village of Oradour-sur-Glane in the South of France was destroyed, with 642 of its inhabitants massacred, by a Nazi Waffen-SS company. In the ranks of this company were 13 Malgré Nous and one Alsatian that had joined the German army freely. In 1953 a military tribunal in Bordeaux heard the charges agains the 65 survivors of the 200 SS present in Oradour-sur-Glane on that terrible June 10. Only 21 were present, seven Germans, and all fourteen Alsatians. Twenty of them were found guilty, including all Alsatians. This lead to uproar in Alsace, including demands for autonomy, that pressed the French parliament to pass an amnesty law for all the Malgré Nous. The Second World War has left Alsace-Lorraine with wounds that are not fully healed. Seventy five years have passed since the drafting decrees of Wagner and Bückel, leading to the Malgré Nous but their consequences are still remembered. Many books and memoirs are being published on this topic, following the release of ore records from the Second World War period. Recond TV shows related to the Malgré Nous and Oradour sur Glane still lead to controversies and heated responses from French from the "interieur" (outside Alsace-Lorraine), and Alsatians and Mosellans. The story of the Malgré Nous should not be forgotten. This is the story of many men and women that became entangled in conflicts much bigger than them. In some sense, it is also my story: one of my great uncle was a Malgré Nous, who fought on the Eastern front, was captured and sent to Tambov, and came home in 1946. This web project takes a different approach to presenting you the story of the Malgré Nous. It seeks to lay the foundations for a more complete view of their experience by using data, maps, and visualizations to generate a more comprehensive picture of their presence on the multiple fronts in Europe during the Second World War. Hopefully the results of these analyses of the records available will provide you with a reference point to understand the Malgré Nous's sense of place and identity amidst the many landscapes of World War II. http://www.memorialgenweb.org/. Databases of Malgré Nous, assembled by Gérard Schutz. E. Vlossak (2015). "Traitors, Heroes, Martyrs, Victims? Veterans of Nazi 'Forced Conscription' from Alsace and Moselle", Rewriting German History, pp 100-118. Full text of the treaty of Frankfurt (in French). The linguistic border ran on the north of the new border, including in the "Alemanic" territories Thionville (also named Diedenhofen under the German Reich), Metz, Chateau-Salins, Vic-sur-Seille and Dieuze, which were fully French-speaking. The valleys of Orbey and Sainte-Marie-aux-Mines were in the same case. Similarly, the town of Dannemarie (and adjoining areas) were also left in Alsace when language alone could have made them part of Territoire de Belfort. Varley, Karine. "Under the shadow of defeat", publisher Pagrave MacMillan, (2008). ISBN 978-0-230-58234-7. Eberhard Jäckel, "Frankreich in Hitlers - Europa Die deutsche Frankreichpolitik im Zweiten Weltkrieg", Deutsche Verlag-Anstalg GmbH, Stuttgart, 1966. Eckhardt, C.C. (May, 1918). "The Alsace-Lorraine Question", The Scientific Monthly, Vol. 6, No. 5, pp. 431-443. Photo and collection, BNU Strasbourg, France. On Mai 18, 1940, the three cantons of Eupen, Malmedy, and Saint-Vith on the East of Belgium were annexed to the German Reich. On September 23, 1941, inhabitants of those regions were given the German citizenship. Not long after that started the forced enrollment in the German army. It is estimated that approximately 8000 Belgian Malgré Nous were enrolled, out of which 3,400 did not come back. Similarly, Luxembourg was annexed to Germany in June 1940. On August 20, 1942, Gauleiter Simon, that ruled Luxembourg, signed a decree announcing that joung Luxembourgish born between 1920 and 1924 had to be drafted in the German Army. Overall, 10,200 Luxembourgish were forced to join the German army, out of which 3150 did not come home. Nina Barbier (2000). "Malgré-elles : les Alsaciennes et Mosellanes incorporées de force dans la machine de guerre nazie", édition du Rhin, Strasbourg. ISBN: 2716504768. Gaël Moullec (2001) "Alliés ou ennemis ? Le GUPVI-NKVD, le Komintern et les Malgré-nous. Le destin des prisonniers de guerre français en URSS (1942-1955)", Cahiers du monde russe, vol. 22, pp. 667-678. G. Herberich-Marx and F. Raphaël (1985), "Les incorporés de force alsaciens. Déni, convocation et provocation de la mémoire. Vingtieme siecle, vol. 6, pp 83-102. J. L. Vonau (2003). Le procès de Bordeaux. Les Malgré-Nous et le drame d'Oradour (Strasbourg: Editions du Rhin).